Alright. I totally wasn’t anticipating to find Girl Scout cookies until later this month or early next month. But I found some in a ‘drive through’ situation (FTW! )…and bought some. And then promptly ate them. But while I wait for my beloved Thin Mints, I can always count on these brownies. It’s a few simple additions to any brownie batter that really matters! If you can’t get your hands on Girl Scout Cookies yet this year, make these to tide over your cravings! 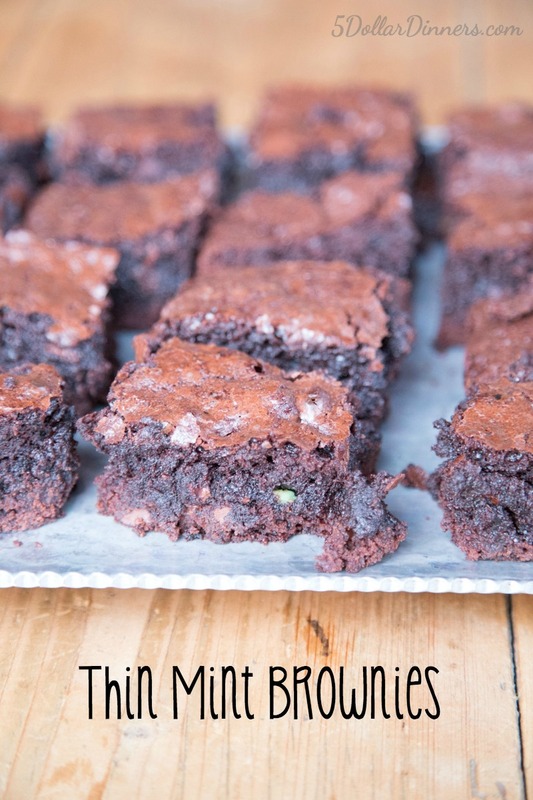 These brownies are magical. Thin-mint-magical! Preheat the oven to 350 and grease and flour a 9×13 inch baking dish. Melt the chopped dark chocolate with the margarine or butter and 1 cup of the chocolate chips in a glass bowl in the microwave for 1 1/2 minutes. Stir together. Let cool while you start on the next part. In a stand mixer or mixing bowl, beat together the eggs, sugar and vanilla. After the chocolate mixture has cooled, beat it into the eggs mixture. Stir in the flour, cocoa powder, baking powder and salt. Then gently fold in the instant coffee, peppermint extract and the dark chocolate-mint morsels.Pour the batter into the prepared baking dish. Bake in the preheated oven for 30 to 35 minutes, or until toothpick comes out clean in the center.